The perfect getaway for two or three adventure-seeking souls. 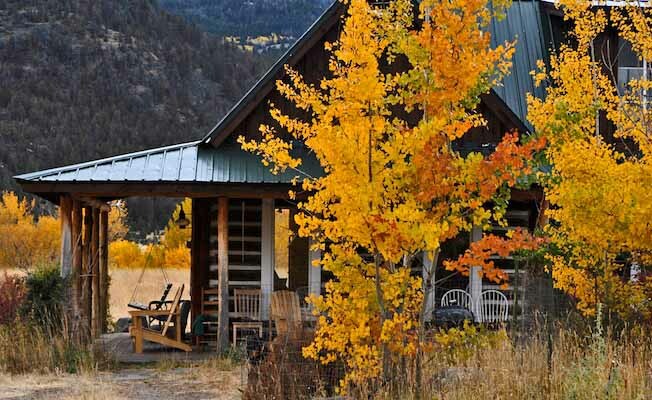 Nestled in the quiet and rural residential neighborhood of Tom Miner Basin, the cabin offers impressive views of the Yellowstone River, Emigrant Peak, and Paradise Valley. The mighty Yellowstone River is a short 10 minute walk or 3 minute drive away with plenty of blue ribbon fishing access points. The north entrance to Yellowstone National Park is an easy 20 minute drive. Reclaimed logs from the former Rock Creek Mill and old barns frame the rustic yet modern ambience of this home to two world travelers. Ellen is a Kiwi and Drew is a Montanan native. Between their international jobs and love of travel, they carefully crafted each square inch with local flare and worldly treasures. The tile on the kitchen island, counter tops, and back splash is from Dolores, Hidalgo Mexico. Rugs from India cover the reclaimed wooden floors. Framed lobster boats from the Bay of Fundy hang next to a big rainbow trout that Drew, the owner, taxidermied himself. The library is full of international best sellers and many books on Montana wildlife, nature, Yellowstone National Park, and other Southwest Montana outdoor adventures. The kitchen and living room are separated by a stone fireplace. Montana summer evenings can be cool and starting a real log fire takes the chill off. Firewood is provided. The living area is spacious with comfy couches, blankets, and a 40' flat screen TV with Cable for relaxing at night. There is a desk in the corner for an office area. The kitchen is fully furnished with extras like a soda stream and french press. The island is a good space for cooking and the wooden kitchen table faces floor to ceiling glass doors for views of the Yellowstone River and Yankee Jim Canyon. Behind the kitchen is a full bathroom with a claw foot tub. The stairs lead to the master bedroom. The loft is cozy with a queen bed and half bath. For relaxing evenings, make sure to use the Weber grill and sit on one of the many adirondack chairs on the wooden porch. Or make use of the two wooden swinging benches.